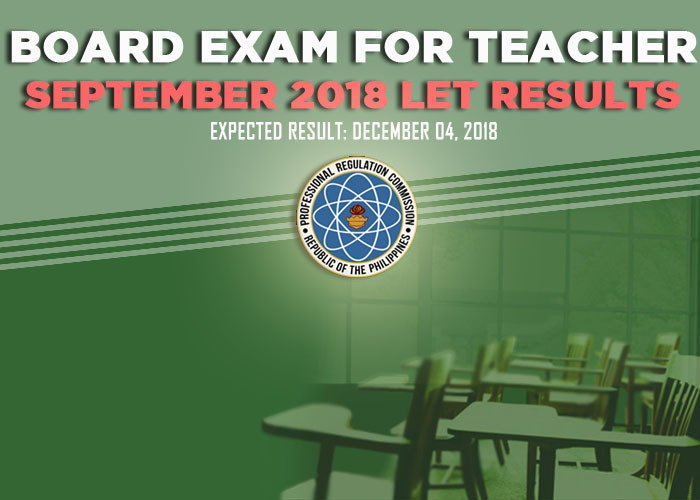 The Professional Regulation Commission (PRC) conducted the second LET board exam this year on Sunday, September 30, 2018 in at least 25 testing centers in the country. Released Date: Based from PRC Resolution No. 2017-1068, the target release of September 2018 LET results is on Tuesday, December 4 or in 44 working days after the test. Note that results may be released ahead or beyond the target without prior notice. PRC Board News, our partner website for PRC exam results said that the probable release date of September 2018 LET exam results is between November 19 and December 7, 2018 ( 34-47 working days). Information is courtesy of PRC.